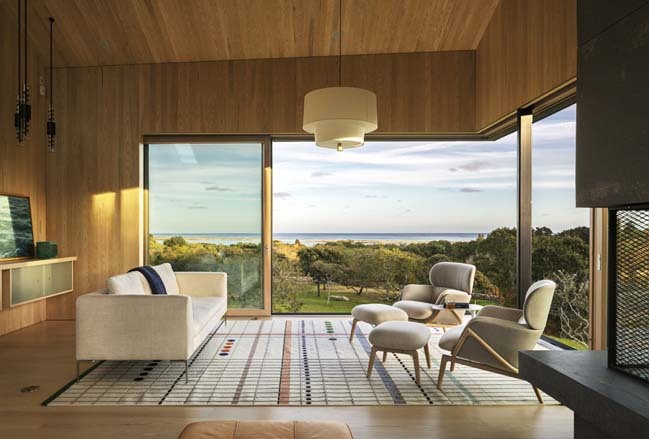 Chilmark House is a luxury home that was designed by Gray Organschi Architecture for a multi-generation family in Martha's Vineyard. 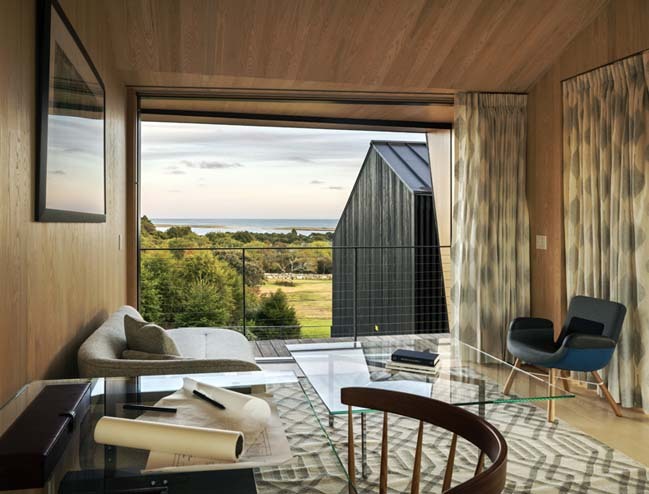 From the architects: The site, a former sheep grazing field, overlooks Chilmark pond, with long views to the Atlantic, and is edged by a series of Chilmark’s massive, meandering stone fences. 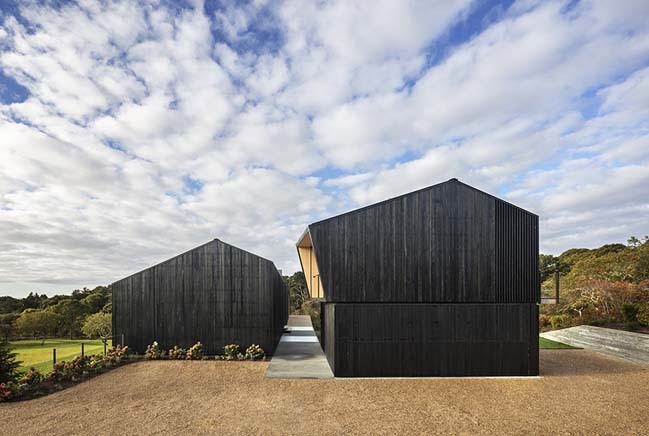 In deference to the field’s history, and to the simple New England forms that shape the area’s architectural heritage, we developed the house and studio as a pair of barns with low pitched roofs that sit quietly in the landscape. 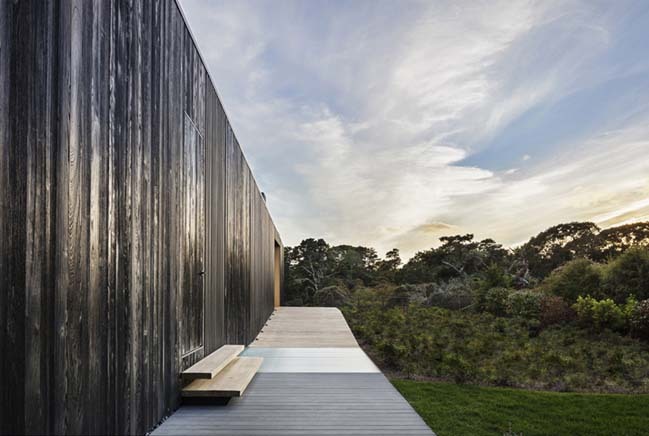 Two buildings form a series of courtyards and outdoor spaces, with varying degrees of privacy and views. 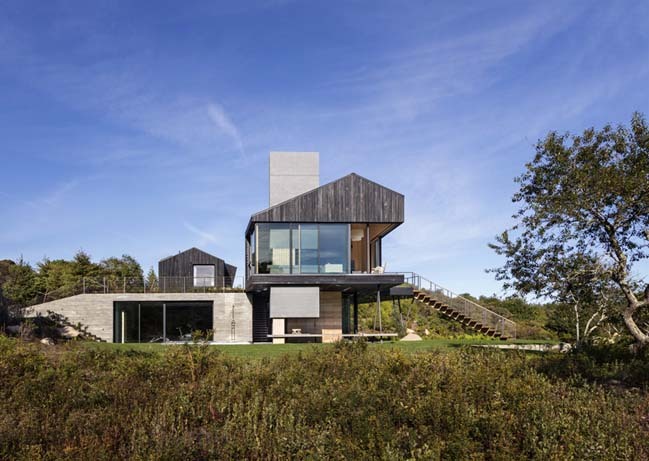 In a nod to New England’s bank barns, the long barn is set into the hillside, diminishing its scale from the north and creating direct connections to the outside from both upper and lower levels. At the heart of this design process lies a mentorship and evolving collaboration. Five years ago, Alan Organschi was approached by his student, Aaron Schiller, whom he had taught during Yale’s first year building project. 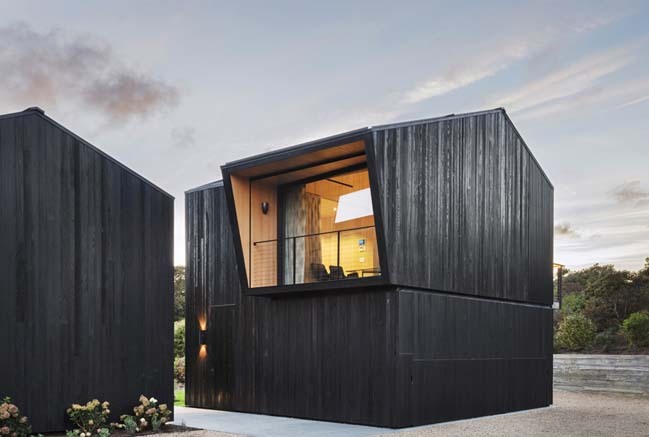 Aaron asked Gray Organschi to share the firm’s long experience with house design and to work collaboratively on the project. Aaron, whose family had spent decades in Chilmark and had outgrown their beloved A-frame, led the family quest for a new piece of land that would accommodate a family compound and, after years of searching, he found this rare piece of land. 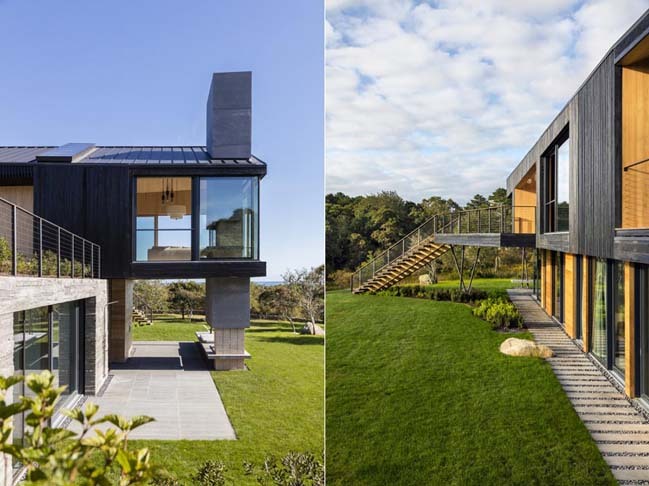 The simple, dark buildings are approached via a farm road that winds through Chilmark’s dense thicket of scrub oak. 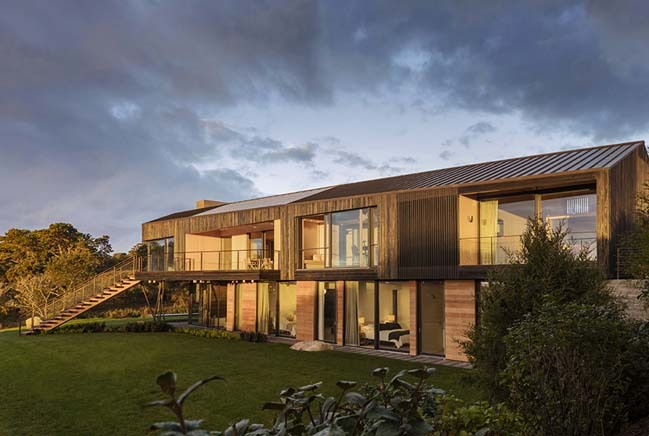 A broad stair links a large south-facing porch back to the farm road and provides pedestrian access through the field to the beaches beyond. 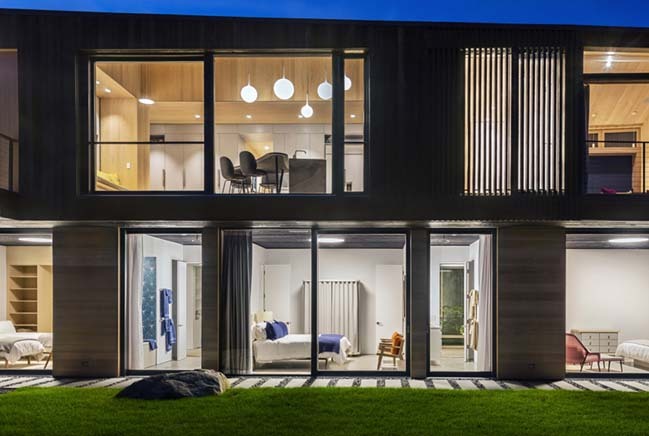 Based in a shared love of the dense aggregation of New England’s farm complexes, we sited the studio and the house barns tightly together, creating a charged outdoor space between them, which provides the approach to the house’s entrance. 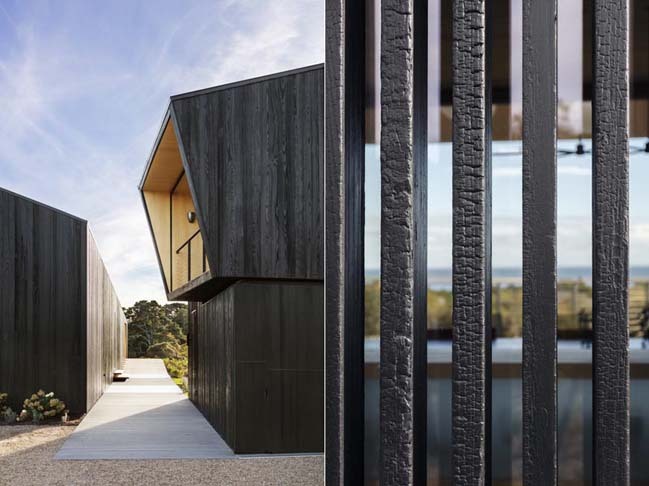 The sweeping Atlantic views are only experienced after a visitor enters the house; the northwest entry courtyard is edged by a mute, charred cedar wall with screened apertures, creating a private courtyard with views west over the rolling fields and stone fences. Inside the dark buildings, bleached ash lines all surfaces. The ceilings in the public rooms lift to the high ridges, with dropped areas to create a children’s sleeping loft high in the roof. 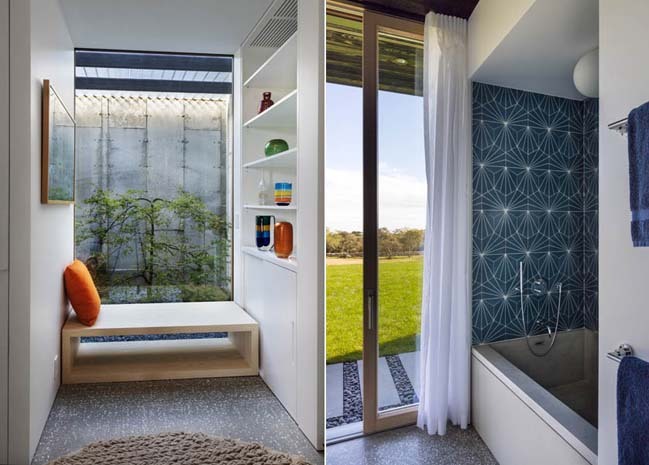 The lower level creates a series of bedrooms with shared spaces between that look into light wells, landscaped with local rocks and moss. The family felt strongly that the house should meld Chilmark’s traditions of simple agrarian forms with its equally compelling history of progressivism and openness. 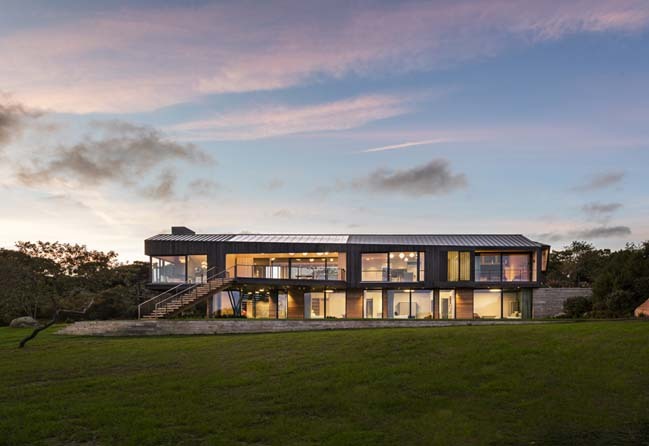 The barn complex sits quietly within the old landscape, while the buildings’ open plan reaches outward to the light and views beyond, providing warm, convivial space for family and friends.